Background: Plasmodium vivax re-emerged in 1993. Although the number of infections has been steadily decreasing, it is likely to continue to affect public health until it is eradicated. The aim of this study is to measure anti-circumsporozoite protein (CSP) antibody and compare malaria prevalence. 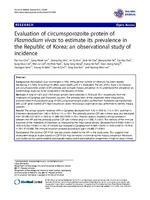 As to understand the prevalence, an epidemiology study has to be conducted in the Republic of Korea. Methods: A total of 1,825 and 1,959 blood samples were collected in 2010 and 2011, respectively, from the inhabitants of Ganghwa and Cheorwon counties. The antibody titers of the inhabitants were measured by enzyme-linked immunosorbent assay (ELISA) using recombinant protein purified from Escherichia coli transformed with a CSP gene-inserted pET-28a(+) expression vector. Microscopic examination was performed to identify malaria parasites. Results: The annual parasite incidence (API) in Ganghwa decreased from 4.28 in 2010 to 2.23 in 2011, and that in Cheorwon decreased from 1.88 in 2010 to 1.15 in 2011. The antibody-positive CSP rate in these areas also decreased from 18.14% (331/1825) in 2010 to 15.36% (301/1959) in 2011. Pearson analysis showed a strong correlation between the API and the antibody-positive CSP rate in these areas (r = 1.000, P < 0.01). The intensity of the immune responses of the inhabitants of Cheorwon, as measured by the mean optical density, decreased from 0.9186 ± 0.0472 in 2010 to 0.7035 ± 0.0457 in 2011 (P = 0.034), but increased in Ganghwa from 0.7649 ± 0.0192 in 2010 to 0.8237 ± 0.1970 in 2011 (P = 0.006). The immune response increased according to age (r = 0.686, P = 0.041). Conclusions: The positive CSP-ELISA rate was closely related to the API in the study areas. This suggests that seroepidemiological studies based on CSP-ELISA may be helpful in estimating the malaria prevalence. Moreover, such studies can be used to establish and evaluate malaria control and eradication programmes in high-risk areas in Korea.